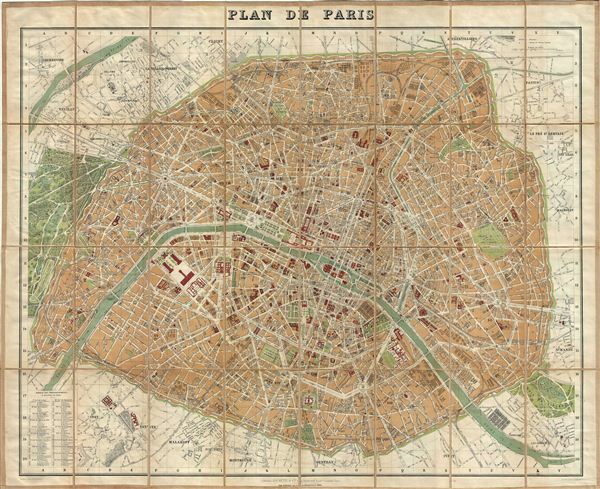 A beautiful example of Alexandre Vuillemin's 1891 map or plan of Paris, France. Centered on the Seine River, the map covers the embastilled center of Paris divided into 20 arrondissments. Fine detail is present throughout the map, with important buildings and monuments, gardens, rivers, roadways, and various other topographical features identified. The eiffel Tower, built for 1889 Paris World's Fair is featured here. A table on the lower left quadrant notes the various districts and neighborhoods in Paris. Contained within small linen bound booklet offering a street directory and map reference. Issued in 1891 by Hachette & Co.
Alexandre Vuillemin (1812-1880) was a cartographer and an book editor based in Paris, France. Despite a prolific cartographic career, much of Vuillemin's life is shrouded in mystery. What is known is that his studied under the prominent French Auguste Henri Dufour (1798-1865). Vuillemin's most important work his detailed, highly decorative large format Atlas Illustre de Geographie Commerciale et Industrielle. Hachette and Company (fl. 1826 – present) was founded by Louis Hachette (1801 - 1864) in 1826 with the purchase of the Paris Bookshop Brédif. Shortly after acquiring the bookshop Louis Hachette began publishing Le Journal pour Tous, a successful general interest magazine. He also published a series of useful reference works which were sold through Paris in bookshops, train stations, and public offices. These included multiple maps and atlases geared toward the tourist visiting Paris for the first time. Louis Hachette himself died in 1864, but his empire continued to grow under the governance of his sons. Eventually the Hachette publishing firm came to dominate French publishing and attracted international interest. Via a series of mergers and acquisitions the firm eventually came under the control of Filipacchi Media and was rename Hachette-Filipacchi. Today the firm publishes books and magazines internationally. Very good. Dissected and mounted on linen. Original linen in good condition. Some wear to linen and map along original fold lines. Folds into linen binder.